example.com. IN TXT "v=spf1 ip4:192.0.2.1 -all"
example.com. IN SPF "v=spf1 ip4:192.0.2.1 -all"
example.org. IN TXT "spf2.0/pra include:example-example.org -all"
example.org. IN TXT "v=spf1 include:example-example.org -all"
example.org. IN TXT "v=spf1 ip4:192.0.2.1 ip4:192.0.2.2 ip4:192.0.2.3 -all"
example.org. IN TXT "v=spf1 a:mx01.example.org a:mx02.exmaple.org a:ns.example.org -all"
example.org. IN TXT "v=spf1 ip4:192.0.2.0/28 -all"
example.org. IN TXT "v=spf1 ip4:192.0.2.101 ip4:192.0.2.102 ip4:192.0.2.103 ip4:192.0.2.0/28 -all"
example.org. IN TXT "v=spf1 mx -all"
example.org. IN TXT "v=spf1 -all"
announce.example.org. IN TXT "v=spf1 ip4:192.0.2.10 ip4:192.0.2.11 -all"
campaign.example.org. IN TXT "v=spf1 include:advertise.example.com -all"
example.net. IN TXT "v=spf1 redirect=example.org"
example.com. IN TXT "v=spf1 redirect=example.org"
example.org. IN TXT "v=spf1 ip4:192.0.2.1 ip4:192.0.2.2 ip4:192.0.2.3" " ip4:192.0.2.4 ip4:192.0.2.5 ip4:192.0.2.6" " include:example.net -all"
example.org. IN TXT "v=spf1 include:_spf-a.example.com include:_spf-b.example.com include:_spf-c.example.com -all"
_spf-a.example.org. IN TXT "v=spf1 ip4:192.0.2.1 ip4:192.0.2.2 ip4:192.0.2.3 ip4:192.0.2.4 -all"
_spf-b.example.org. IN TXT "v=spf1 ip4:192.0.2.11 ip4:192.0.2.12 ip4:192.0.2.13 ip4:192.0.2.14 -all"
_spf-c.example.org. IN TXT "v=spf1 ip4:192.0.2.21 ip4:192.0.2.22 ip4:192.0.2.24 ip4:192.0.2.24 -all"
【誤】example.org. IN TXT "v=spf1.0 include:example.net -all"
【正】example.org. IN TXT "v=spf1 include:example.net -all"
【誤】example.org. IN TXT "v=spf2.0/pra include:example-example.org -all"
【正】example.org. IN TXT "spf2.0/pra include:example-example.org -all"
【誤】example.org. IN TXT "v=spf1 mx nm nm1 ~all"
【正】example.org. IN TXT "v=spf1 +mx +a:nm.example.org +a:nm1.example.org ~all"
【誤】example.org. IN TXT "v=spf1 ip4:192.0.2.1 ip4:192.0.2.2 ~all"
example.org. IN TXT "v=spf1 a:mx01.example.org ~all"
example.org. IN TXT "v=spf1 a:web.example.org ~all"
【正】example.org. IN TXT "v=spf1 ip4:192.0.2.1 ip4:192.0.2.2 a:mx01.example.com a:web.example.org ~all"
example.org. 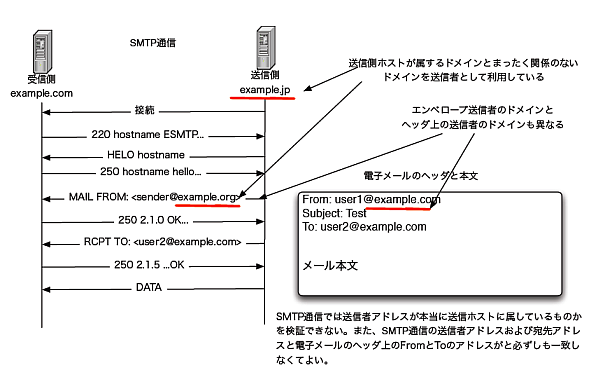 IN TXT "spf2.0 ip4:192.0.2.1 ip4:192.0.2.2 a:mx01.example.com a:web.example.org ~all"
【誤】example.org. 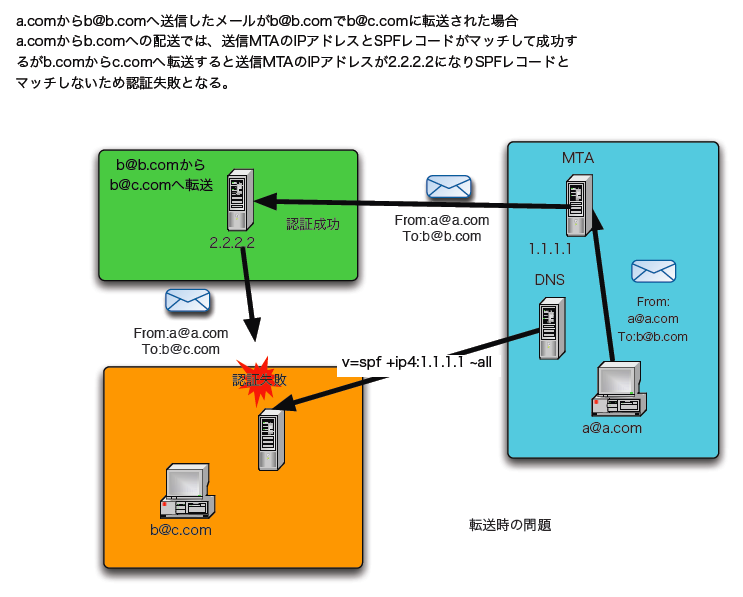 IN TXT "v=spf1 ipv4:192.0.2.1 mx ~all"
【誤】example.org. IN TXT "v=spf1 ip:192.0.2.1 mx ~all"
【誤】example.org. IN TXT "v=spf1 ip192.0.2.1 mx ~all"
【誤】example.org. IN TXT "v=spf1 ip4=192.0.2.1 mx ~all"
【誤】example.org. IN TXT "v=v=spf1 ip4:192.0.2.1 mx ~all"
【誤】example.org. IN TXT "v=spf1 ip4"
【誤】example.org. IN TXT "v=spf1 ip4:192.0.2.1 mx \150all"
【正】example.org. IN TXT "v=spf1 ip4:192.0.2.1 mx ~all"
【誤】example.org. IN TXT "v=spf1 ip4:192.0.2.64/26" "ip4:192.0.2.101 ~all"
【正】example.org. 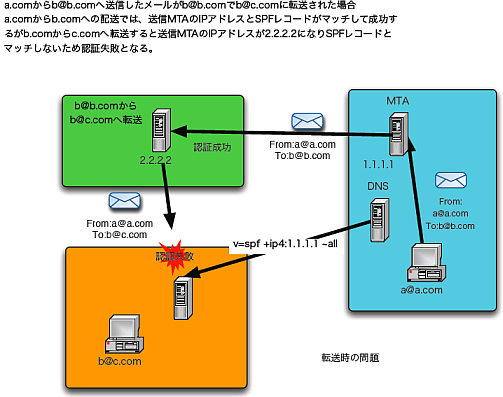 IN TXT "v=spf1 ip4:192.0.2.64/26 ip4:192.0.2.101 ~all"
【誤】example.org. IN TXT "v=spf1 include:_spf.example.org ~all"
_spf.example.org. IN TXT "v=spf1 include:example.org ~all"